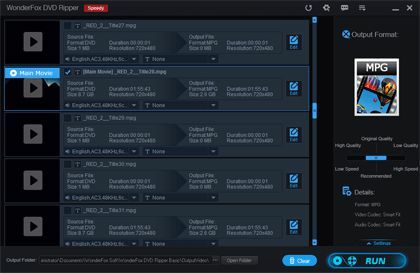 WonderFox DVD Ripper Speedy is a powerful free DVD ripper software which can rip DVDs to all popular video formats such as AVI, MOV, FLV, WMV, MPEG, MP4, 3GP, VOB, MKV, and ASF etc. Supports normal DVDs, encrypted DVDs and all region 1-6 DVDs. It works very nice on my computer and of course safe!Helps me ripping my dvd collection to mpg format at very fast speed.